OK, so what better way to combine two of my favorite movie time foods? This recipe is so easy and great for movie night at home or a snack. Pop the kettle corn in the microwave as directed on package. Remove unpopped kernels. Add popcorn, stirring to coat. 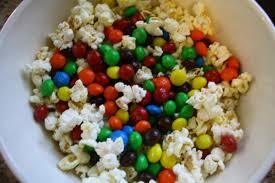 Stir in M & M’s. Let set for 5 minutes. Dip hands in cold water and form mixture into 10 balls. Store popcorn balls in individual plastic bags at room temperature. Melt butter in a large pot and add marshmallows. Stir until smooth and all melted. Add popcorn to a large bowl and pour the melted butter marshmallow mixture over top of popcorn. Stir well to coat popcorn. 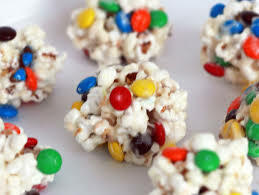 Add M & M’s and stir well. Let stand for 5 minutes. Store popcorn in individual plastic bags at room temperature.